Here’s the latest scoop on the 3G Apple iPhone as reported by infosyncworld who say their source of information is reliable. Apparently the second-gen Apple iPhone will see the light of day on the 9th of June at the World Developers Conference. The latest iPhone will be 3G as I guess everyone knows already. Many rumours have been spoken over the net but apparently the 3G Apple iPhone will not go on sale straight away. Infosync’s source states that the next-gen iPhone won’t go on sale until a week and a half later around 18th/19th June, and word has it that AT&T employees have been asked not to take any vacation as of 15th June. Other than those few titbits of suppose reliable information everything else on the 3G Apple iPhone is as expected only speculation. Obviously it is expected to have HSDPA networking as that is the 3G network of the original iPhone’s only carrier, AT&T. Of course it would be great if there was no exclusivity to AT&T but that’s probably not going to happen. True GPS navigation is also speculated, since A-GPS chips have been mandated in mobile phones for emergency purposes for quite a while now. And with any luck driving directions will be handled via a real navigation application and not just Google Maps. The AT&T Navigator would be a step in the right direction, but we all know how Apple shy away from carrier bases services such as AT&T video and AT&T music. For the same reason it is probably unlikely the 3G Apple iPhone will incorporate mobile TV, besides, it’s an unproven technology within the US market. Anyway adding yet another radio to allow mobile TV on the 3G iPhone may drain battery power way too much, and will probably convince Apple to give mobile TV a miss this time round. Really, the best move Apple could make is getting the new 3G iPhone insured and subsidised along with dropping its price rather than opting for a bunch of features thrown in for parity with AT&T’s major competitors. Personal view: It’s so close now, why listen to rumours no matter the reliable source. One thing is for sure, we will find out all about the 3G Apple iPhone soon enough. Will we get the new phone at special price if we already own the first model ? 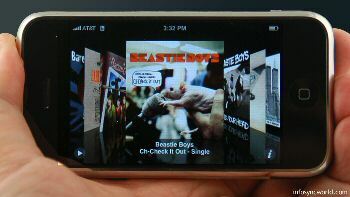 I would like the iPhone to have stereo bluetooth for music. I have been waiting for that feature for a long time.